2. I have really been craving smoothies lately, but I haven’t been able to make any. I’m in the process of moving, and the blender has already been packed away. I was hoping to make Amanda’s banana bread muffins quick and easy, but I guess I will have to go old fashioned with the whisk and bowl. I know it will be worth it though. I am a fan of thick and creamy smoothies. I’ve never liked really liquidy, water-like smoothies. 3. 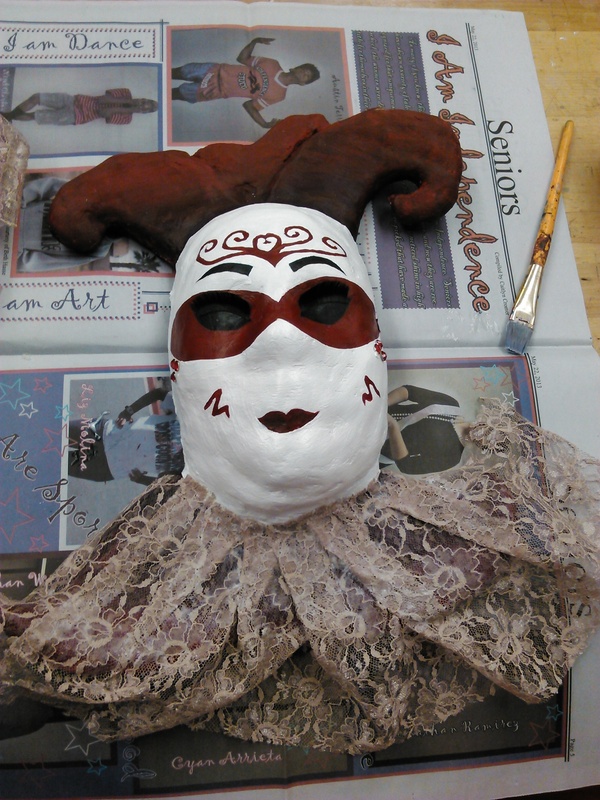 As promised, I FINALLY finished my mask! It has been a long process, but I finally gotten it to the way I like it. It really did turn out better than I expected. 4. This year, I have met some pretty amazing people. One in particular is my close friend that is in my art class. She is literally like a sister to me. Things have been overwhelming in my life lately, and she has always been here for me. She’s held me when I cried, talked me through some of my deepest problems, been there for ideas/advice, triumphed with me at all the joys. She has always been there. ALWAYS. I know that even when we go our separate ways, we will always stay in each others lives. She’s one hell of a friend. 5. My body is still sore from the workout I did on Monday. I felt like doing leg day, and I kid you not.. in total, I did 1015 reps. Yes, you ready that number right.. 1015! I have been walking a little wonky lately, but I was really feeling the power. I pushed myself farther than I imagined I could. Goes to show how much our bodies are really capable of. 6. I don’t think I’m ready for the weather to reach close to the 100s over the weekend. I’m already getting some serious burn lines from the outlines of my shorts and shirts. I don’t know how I even survive Arizona’s heat. I’m really not looking forward to the close to 120s heat. Oh man.. Pool side for me all summer! 7. I have been having this song on repeat for the past week now. I love it so much. 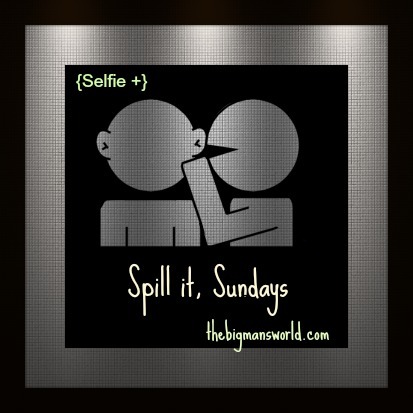 It’s so catchy and I always catch myself singing along to it. 9. I now have to take classes on Saturday mornings until the 24nd. It’s for a good cause, so I can’t complain, but another day at school? Oh my..
10. My goals for May are..
-What are your goals for May? -What is your favorite smoothie? -What song has been on repeat for you? Life has been hectic lately. I have been neck deep with school work ranging from studying for exams and finals, projects, memorizing different material, working on Public Based Assessments, and study sessions. I have gotten to the point of breaking down from the stress. I admitted to myself that I did pile on too much this year. I did it because I thought it would make my parents proud. They have always expected me to be the one to get the good grades. They see a bright future for me, so I don’t want to let them down. While trying to do what made them happy, I lost myself. Do not get me wrong, I love learning and I am blessed to be able to receive an education and attain all of the knowledge I have, but I’m not happy with how much I have to do. I know.. I know.. in order to reach success, you have to make sacrifices and do what it takes, but what about when that goes too far? I sacrificed my happiness in order to do what would make others proud of me. I am proud of myself for pushing myself through everything I am, but I have missed out on so many things. I’ve missed out on time with friends, time with family, time with myself. All I focused on was doing what made everyone else happy. I set the expectation bar too high. School is coming to an end and I want to do what makes ME happy. I had a talk with God and asked for guidance. I asked for the boulders to be lifted off of my shoulder and guide me to the life that would make ME happy. I did feel a bit selfish for asking to find what makes ME happy, but in all honesty, that’s what I NEED to do. I lost myself this year. I stopped doing what made my happy. I stopped drawing and painting. I stopped spending my weekends with my family and friends. I stopped cooking and baking. I stopped playing sports. I stopped so much. Once school is over, I am going to focus more on ME. I am going to focus more on my art. I can get lost in a whole new world once you hand me a pen, pencil, paint brush, paint, and paper. Art is how I express myself. I am going to focus on spending more time with my friends and family. I have so much lost time to make up for. I am going to focus on cooking and baking more. The kitchen it therapeutic for me. I get lost in the aromas and my mind just frees from all of the stress I may feel. I am going to focus more on being active and playing sports. 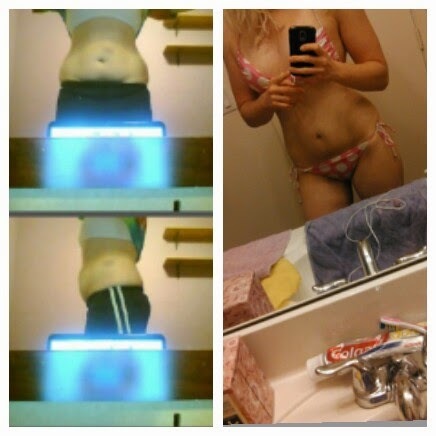 I am going to start playing volleyball and soccer again along with lifting, pilates, hiking, and yoga. I love being active. I am going to focus more on hiking, because it is my new found passion. I am going to focus on ME. 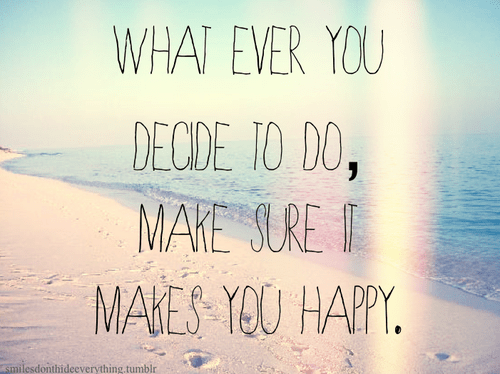 I’m going to do what makes ME happy. When I do what I love, I am the most happiest. When I spend time with the people I care about and love, you will never catch me without a smile. I have let what I think what would make other people happy consume me. I realized that I can’t truly make other happy if I am not happy first. Art makes me happy. Being active makes me happy. Family makes me happy. Friends make me happy. Music makes me happy. 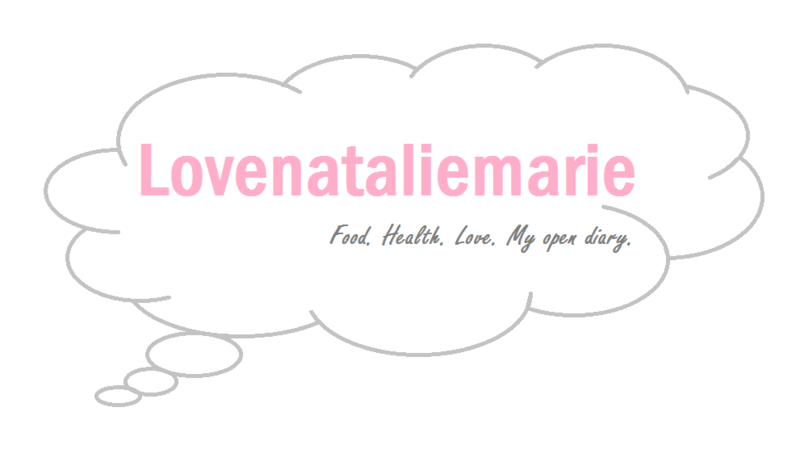 Blogging makes me happy. Cooking makes me happy. Baking makes me happy. Hiking makes me happy. Going out and enjoying life makes me happy. I’m on a journey to focus on what makes me happy. I am going to find myself again. I am going to be happy. I am going to do what I love. I am going to be me. -Have you ever lost yourself? 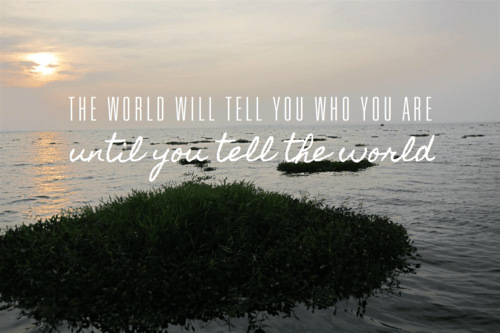 How did you find yourself? -What are your thoughts on this? I hold family so close to my heart. They have been there for me since day 1. 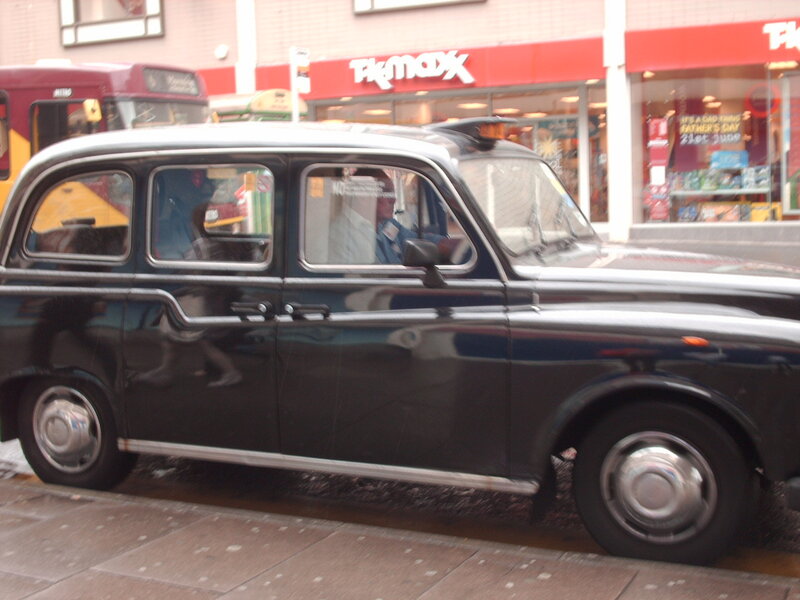 I will admit it, I did not always have the best relationship with them, but our relationship has been fixed. Times get rough, but they are the ones I go to whenever I need someone to talk to, cry to, rejoice to, etc. I would be lost without them. I know one day I will have to spread my wings and leave the coop, but for now, I am embracing every day I have with them. 1. What is your most memorable family memory? 2. What is a tradition sacred to your family? -We always, and I mean ALWAYS, have a game night on Christmas Eve. I absolutely love it. We will put on a Christmas movie, eat some good snacks, and stay up late playing games. I am truly my happiest when we do that. We get a bit competitive, but it’s always filled with laughter and smiles. We usually finish around 11:30 and then head to bed. My mom always makes hot chocolate as well. Pure bliss. -We were in Mexico years back and I’m not going to lie, my dad had a few drinks. He didn’t really eat dinner, so he went back to the room to sleep. When we came back, we all got ready for bed, and a few hours later, we found him rumminging through the food. I kid you not.. he was in his underwear standing by the door. He was propped again the door (trying to act cool) and the only words that came out of his mouth were “I’m hungry now.” He even went outside to go to the food place, but my mom had to run to get him. He then went to lay down next to my sister (since they are both snorers) and kept asking if she wanted to go swimming. You probably don’t think it is funny reading it, but my mom, sister, and I were dying. He didn’t remember any of that and still doesn’t. 4. 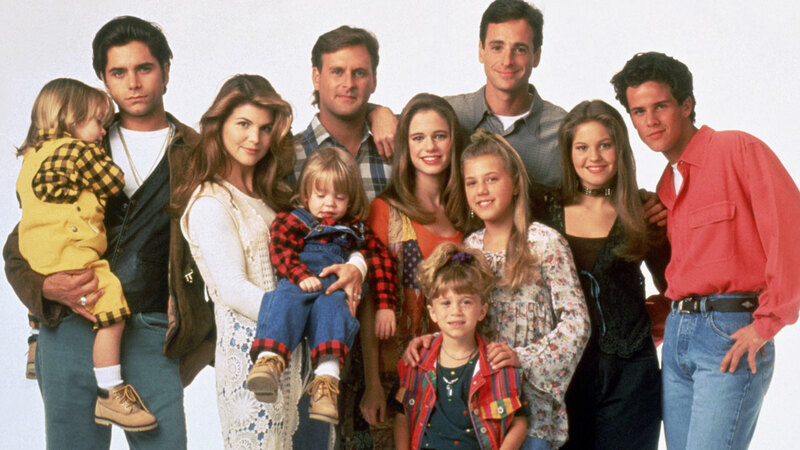 Which TV family would you consider most similar to yours? 5. If you could trade families with one on TV, who would it be? 6. 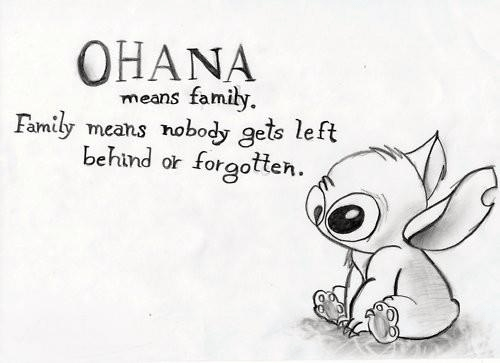 What does your family mean to YOU? -Support. Unconditional and everlasting love. Understanding. Being there for you from day 1. Trust. Comfort. Loyalty. Faith. Patience. Care. -What does family mean to you? -What traditions do you have with your family? -What’s your favorite family memory? -Which tv show best describes your family? 1. All I can think about mainly is the Spanish final I have today. Ergo the intro phrase. I know what I have to do and I have memorized what I have needed to, but speaking Spanish is something that always gets me nervous. We have to answer three questions and then describe a picture into a recorder. I get the jist of what I need to and my teacher said I have become the most improved in the class. Fingers crossed that my mind won’t go blank and I freeze up! 2. I have another practice final AP exam this Saturday morning. 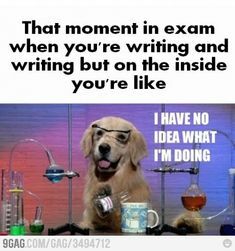 Remember that 3 hour straight test I had? Well, this is another one. This is the last practice final I have though. Then, I just have to prepare for one on May 9th and one on May 15th. From there, everything regarding school will become so much more easier. 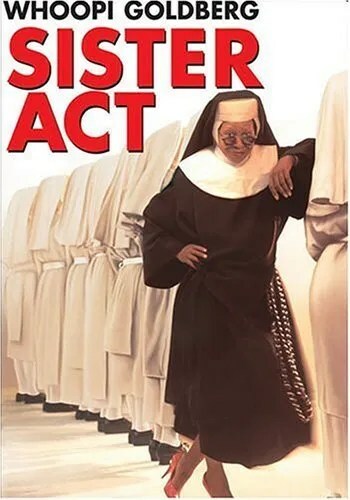 Hallelujah! 3. For two weeks I have been mentioning the progress on my mask, and well you guys, I am so close to being finished with it! It took a lot of work, patience, and creativity. I’m really happy with how it is turning out. 🙂 Our next project is going to be a Tim Burton inspired artwork. I love Tim Burton so this will be right up my alley! 4. So.. I went for a run last night. I didn’t have any intentions on going for a run, but I did it. I was going to meet up with a friend, and on my way home, I decided to take long route. Although Arizona has been having some pretty killer days, the nights are glorious. I can’t say it was the best feeling ever (due to a slight stomach cramping), but it really got me wanting to build up my endurance. Of course I’d want to start running again when it’s getting close to the 100 degrees F.
5. This is really random, but it’s offical.. I hate jeans. With the more muscle I have been putting on, I cannot fit my thighs or booty into my jeans. The struggle is real. Thank goodness it’s time for shorts, dresses, and skirts. -What is your favorite store to shop at? 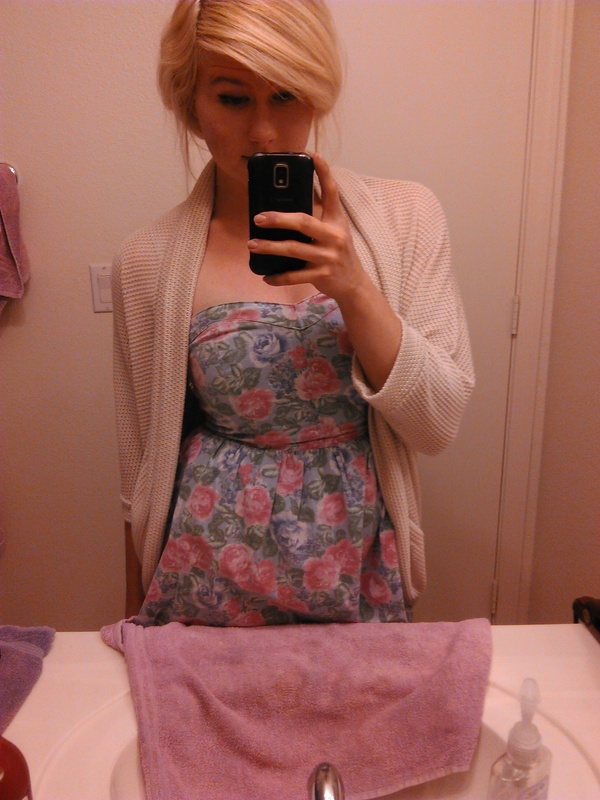 -Any recommendations for places or apps that I can buy cute dresses from? -Tell me something about your or that is on your mind. 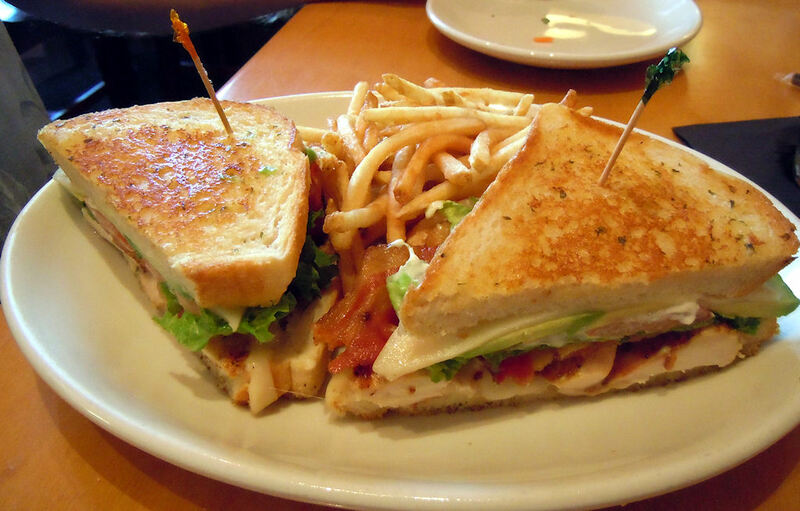 A Grilled Chicken Club with fries from BJ’s. 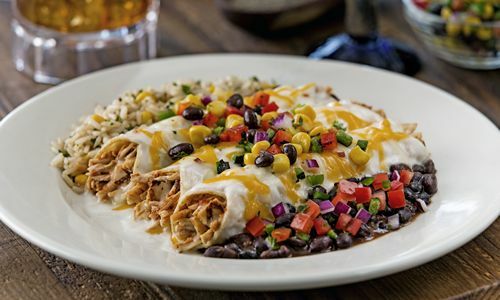 Chicken Enchilads with rice and beans from Chili’s. 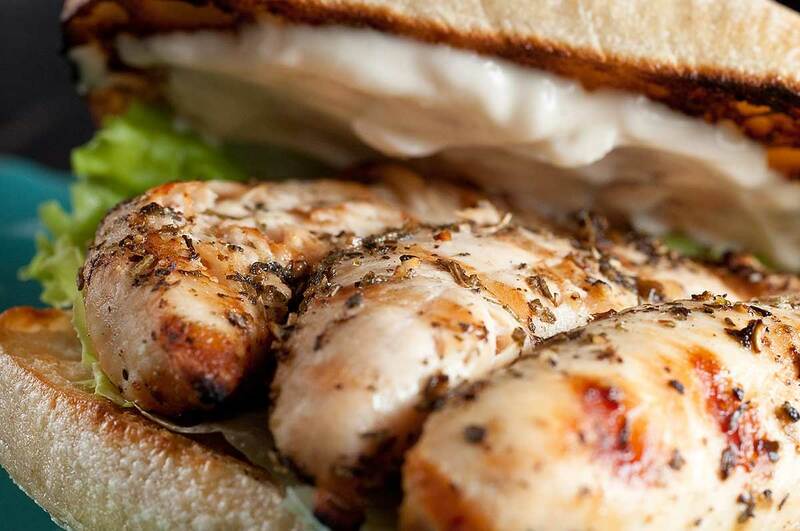 Grilled Chicken Sandwich with asparagus from Dilion’s BBQ. 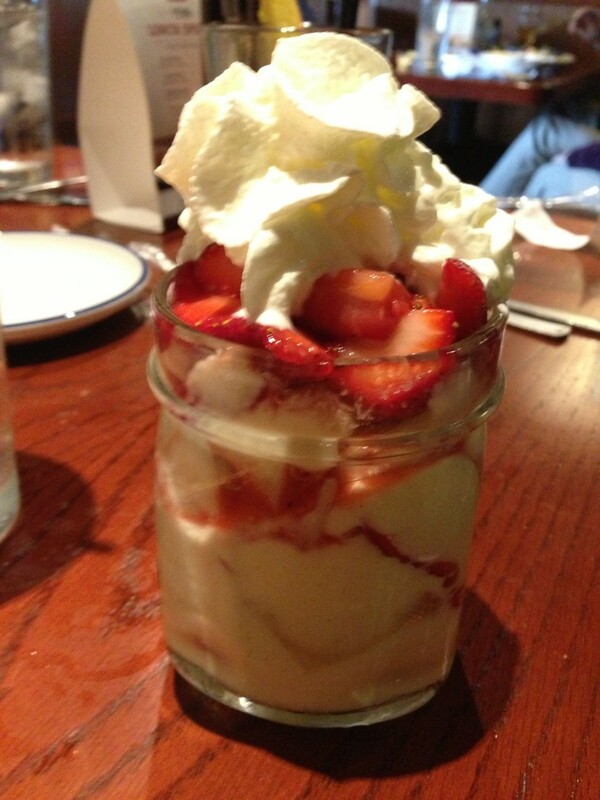 Strawberry Shortcake in a jar from Red Lobster. 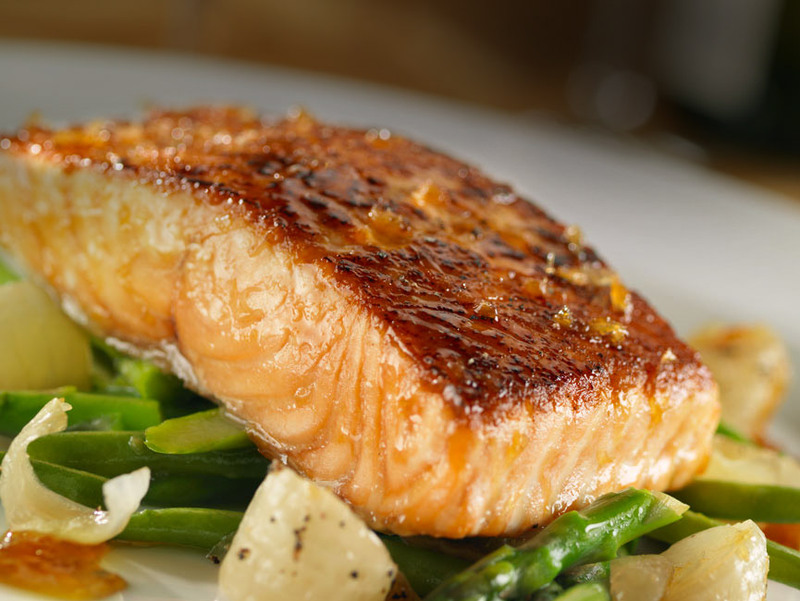 Salmon with veggies from Red Lobster. 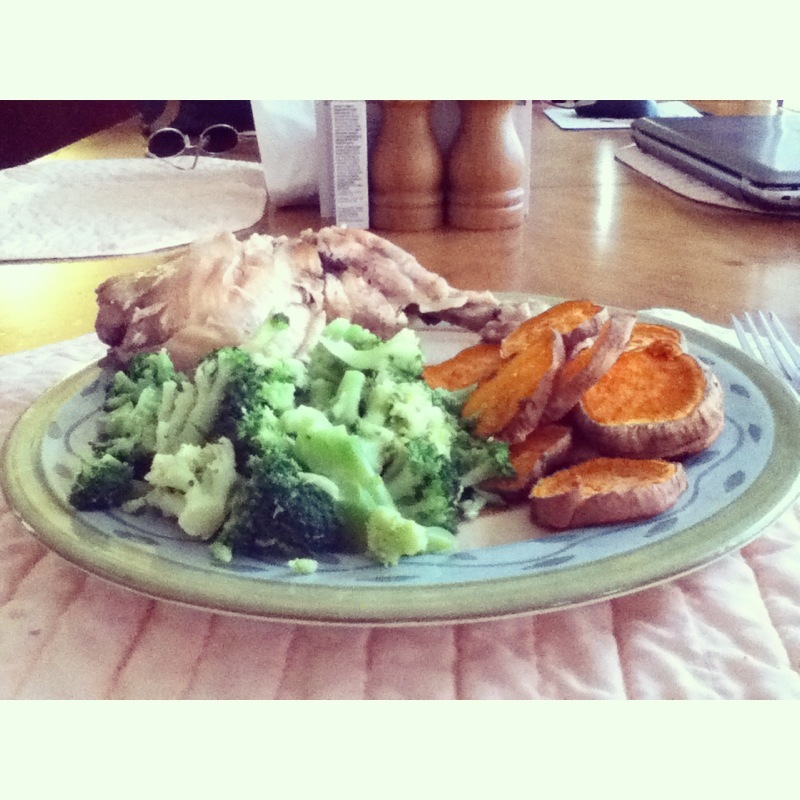 Chicken, sweet potato, and broccoli. 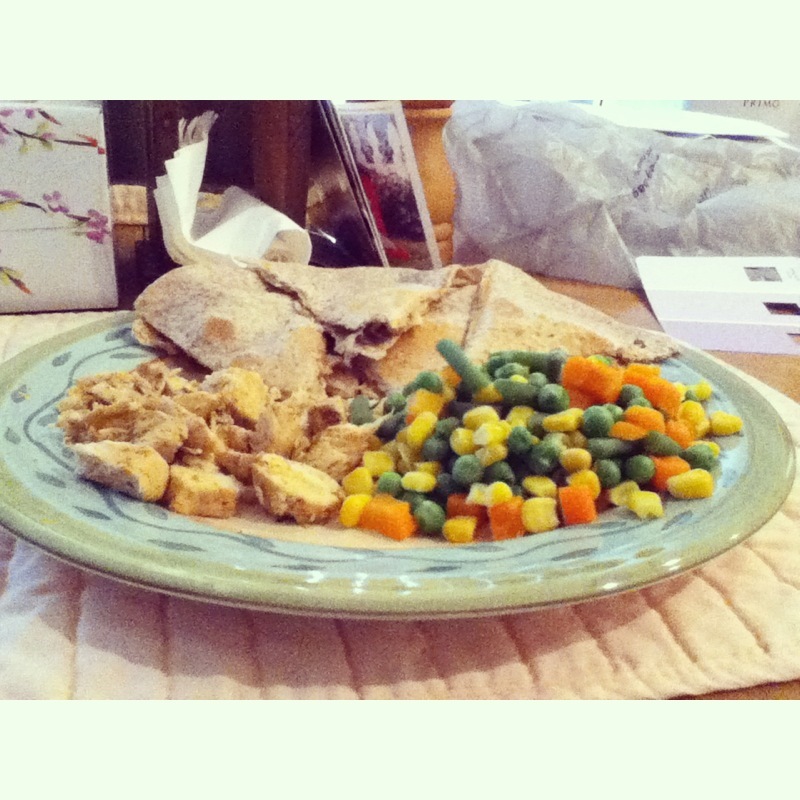 A chicken + cheesse + onion + red bell pepper quesadilla with extra chicken and veggies. 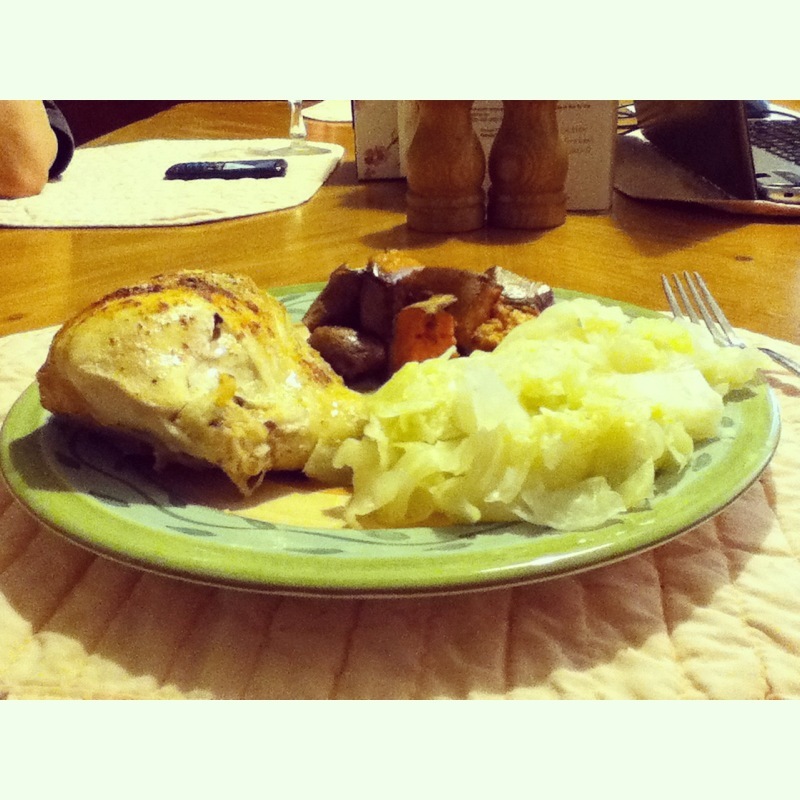 Chicken, sweet potato, and cabbage. 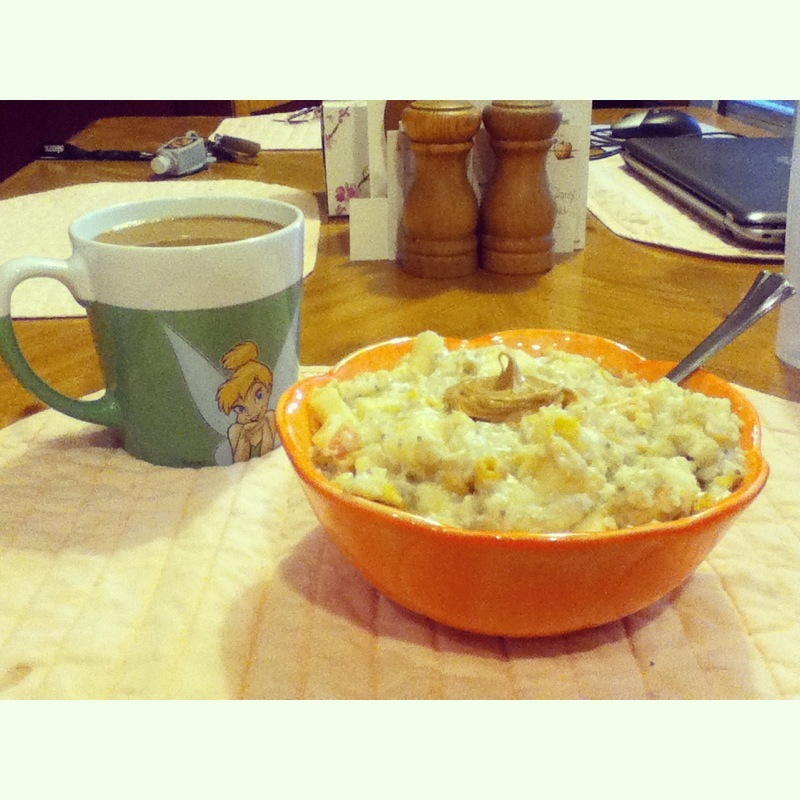 Caramel coconut oatmeal with coffee. 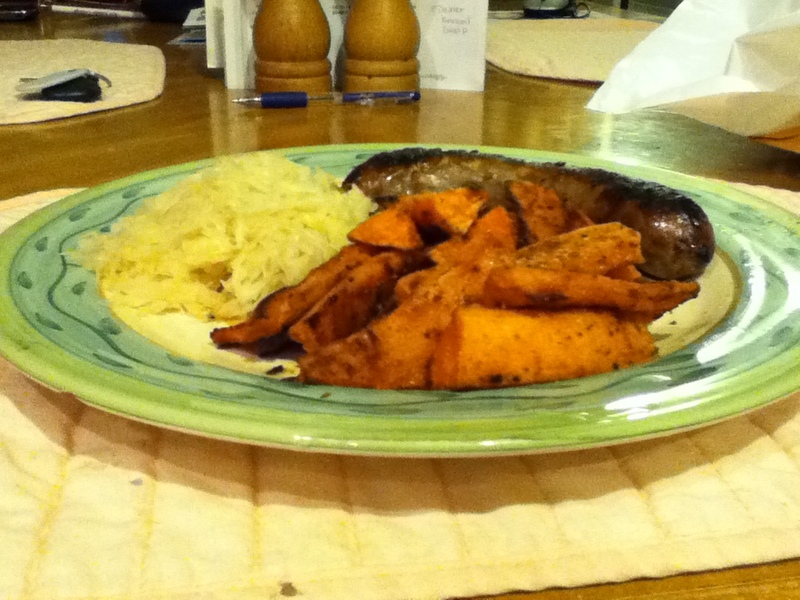 Bratwurst, sauerkraut, and sweet potato fries. 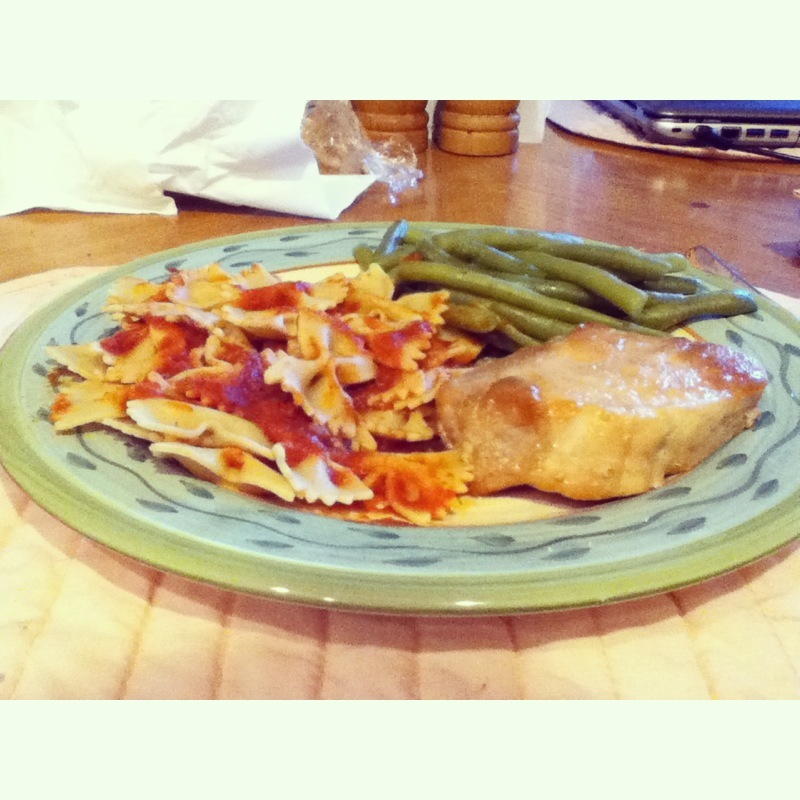 Pork chop, fresh green beans, and whole grain pasta. 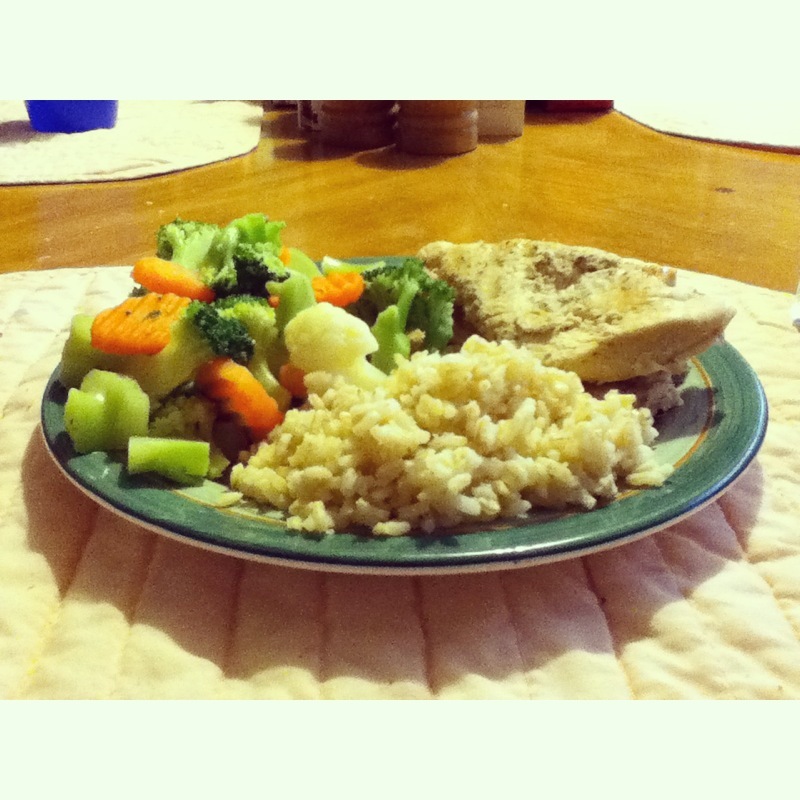 Grilled chicken, brown rice, and veggies. 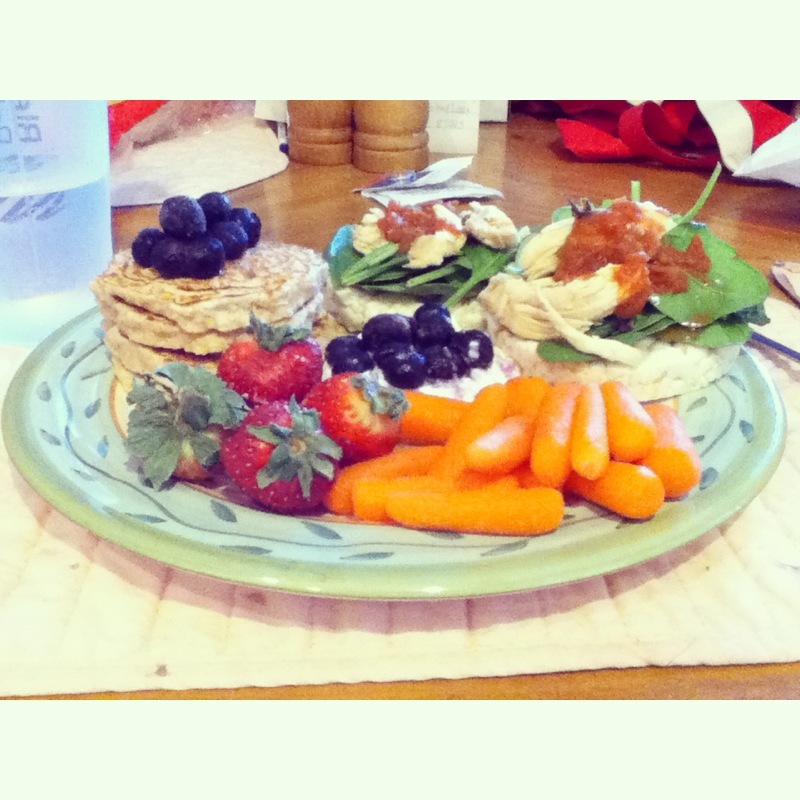 Vanilla protein pancakes topped with blueberries, two rice cakes topped with spinach + chicken + salsa, carrots, cottage cheese, and strawberries. 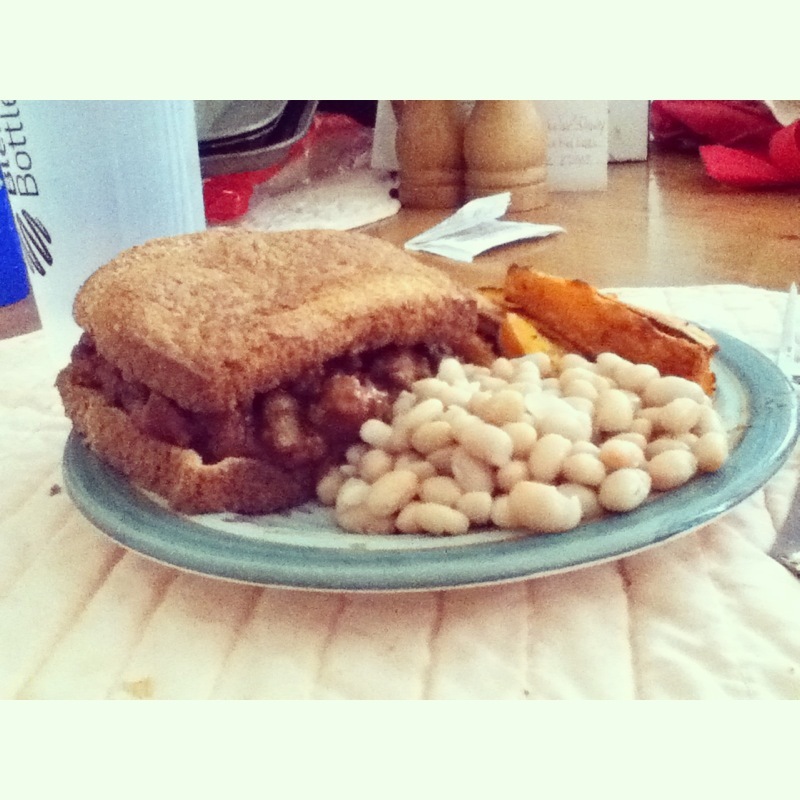 A sloppy joe, sweet potato fries, and white beans. 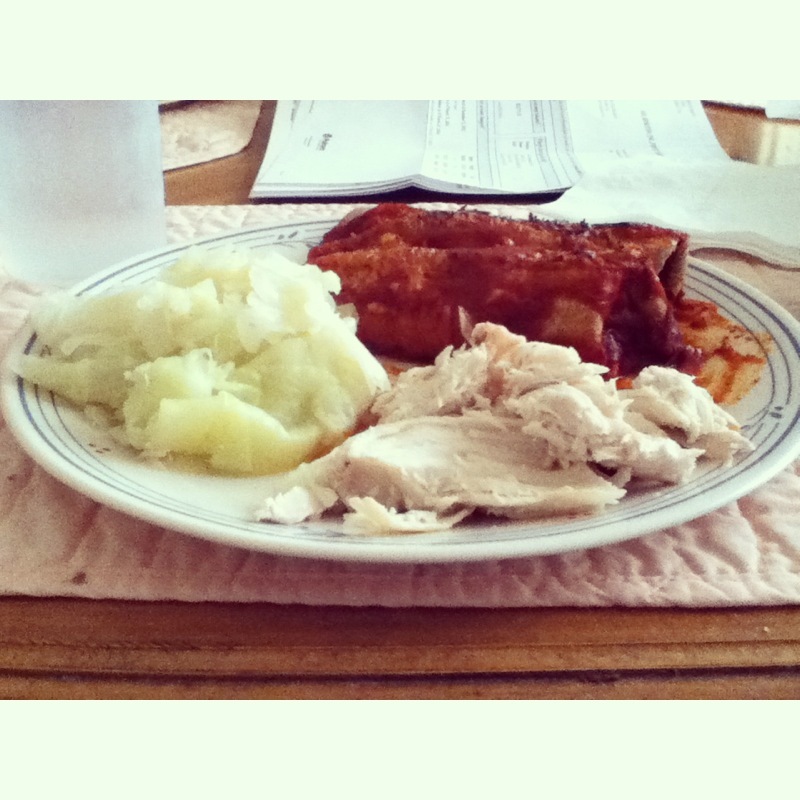 Chicken and cheese enchiladas with red sauce, cabbage, and chicken. 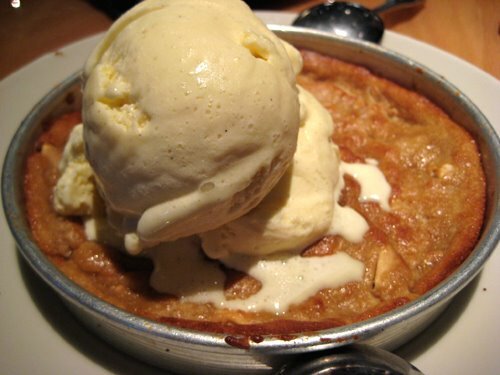 A peanut butter Pazooki from BJ’s. DELICIOUS. 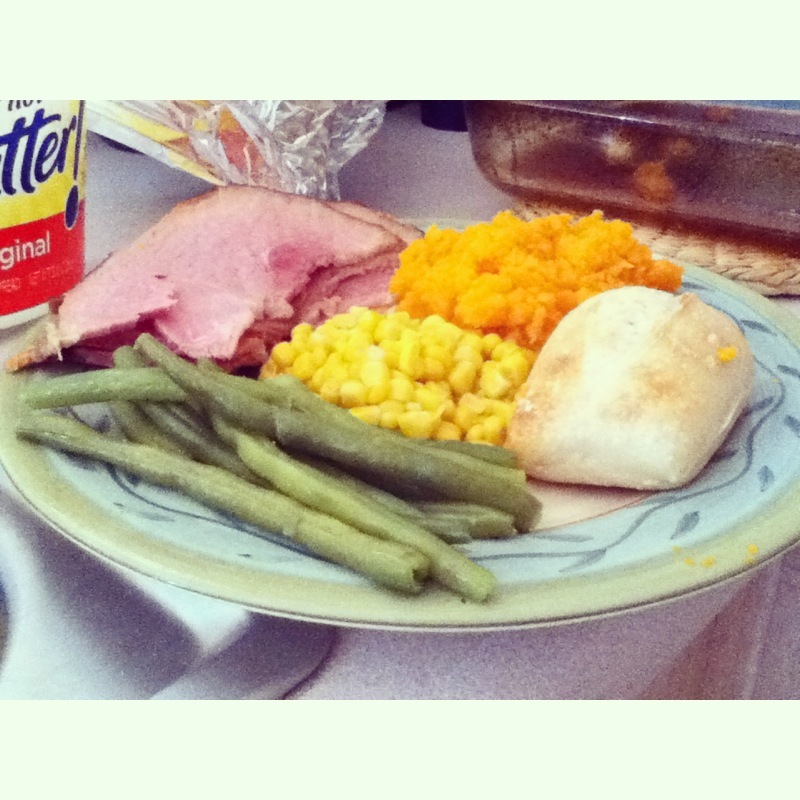 Easter dinner: Honey glazed ham, mashed sweet potato, corn, fresh green beans, and a biscuit. 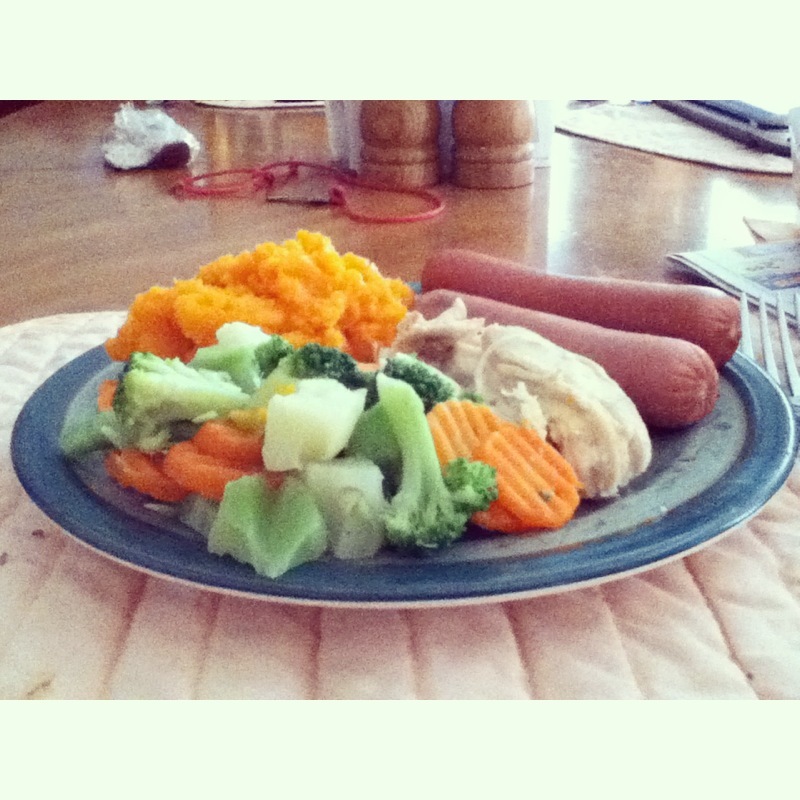 Turkey hot dogs, chicken, mashed sweet potato, and veggies. 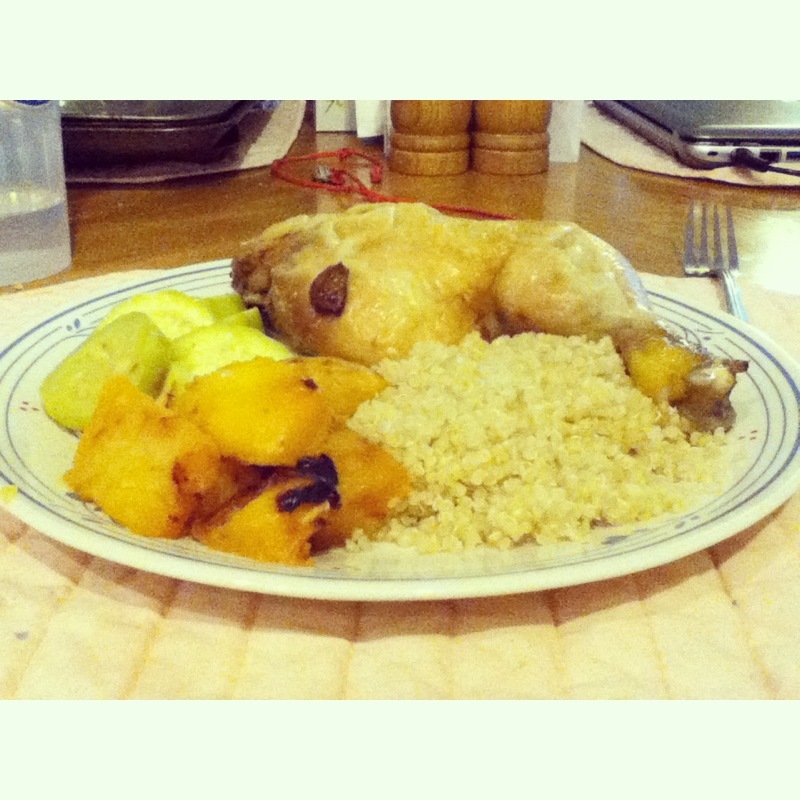 Baked chicken, quinoa, rutabaga, and zucchini. -What have you eaten recently? -What do you eat when you’re stressed? -What’s your favorite food? Sweet treat? Let’s Talk Over Some Breakfast, Shall We? 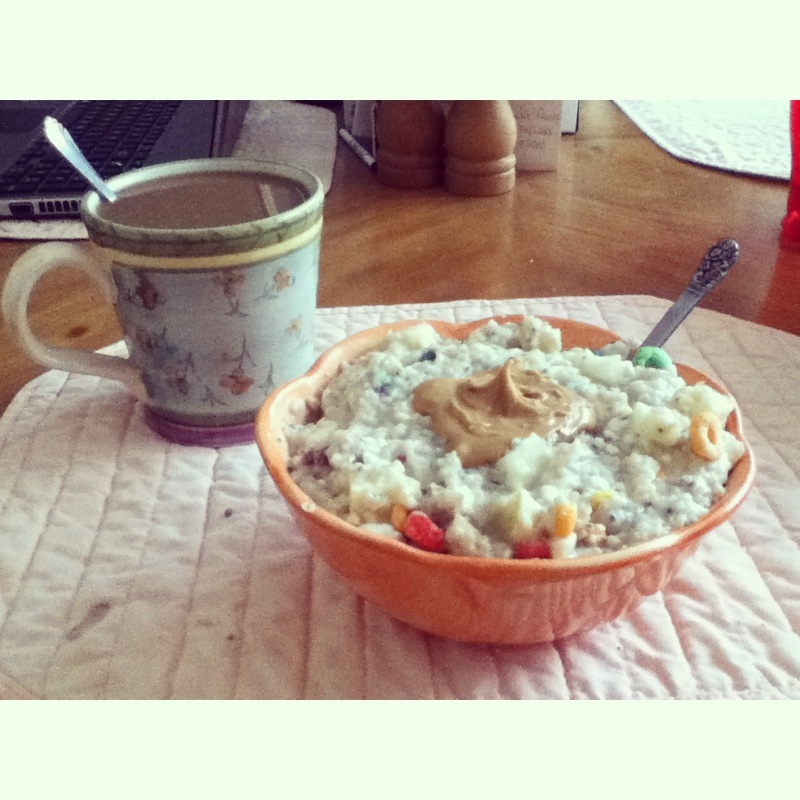 Lately, I have been adding cereal to my oatmeal. Last week it was Fruit Loops and now this week is Corn Flakes. 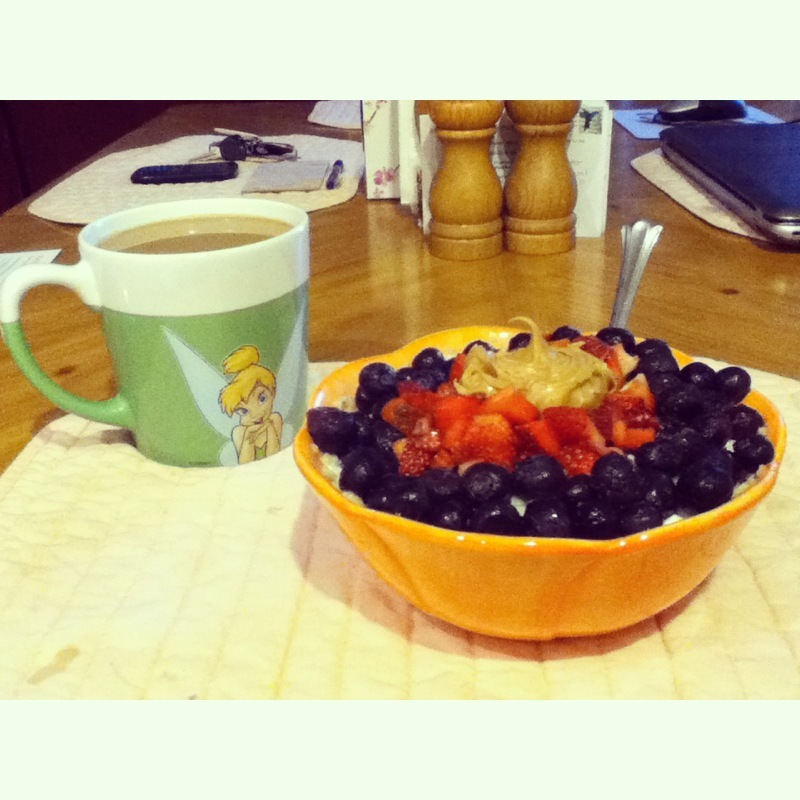 You guys, I have been loving (and I mean loving) Corn Flakes lately. Do you like that cereal? I used to not like it, but now I get excited when we stock up on it. Do you get excited over food? Or is that just me? I admit it.. I love the mountains. I have been craving a good hike every weekend. 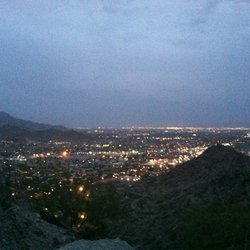 I think it was that one night where I saw a beautiful view of Phoenix from the top. I have found a few mountains to hike now. It may also be because of the warmer weather. I just have to make sure I have sunscreen or I will turn red in an instant. I kid you not when I say I don’t tan. My parents finally don’t give me any weird looks when I take pictures of my food. Finally! They used to always question me on why I did, but now they just smile and go on with whatever they are doing. I just discover that I have a bruise on the bottom of my palm on my right hand. Is it possible to bruise there? Has this happened to anyone else? I will be moving in exactly 18 days. I used to think it was going to be a while before I do, but it’s coming faster than expected! I’ve already painted my walls and picked out a new comforter. I’m pretty excited, can’t you tell? There is also 28 more days of school. WHAT?! I just blew my own mind this weekend.. Haha. I know I keep saying this, but I really want to get to know the people that read my blog. Seriously, you guys are amazing if you do. I never thought anyone really would, but here you are. You’re awesome. Since I can’t give you a real hug, I will give you a virtual one, mkay? *computer hug* Ahh.. now if only I could have a blend meetup. That would be awesome! -What are your thoughts this morning? -What’s been going on in your life? -Where do you want to travel to? This weekend was definitely one filled with self rejuvenation. I decided that I needed a break from going out and just spending time at home. Lately I have been going out more with friends and enjoying that time, but I really just needed a weekend in with all of this stress I am under. I have to tell you, I have never felt better on a Monday. Marvelous was.. going on a night hike with friend on Friday. I have never been night hiking before, so this was a really new experience for me. Lately, I have a new found love for the mountains. I seriously want to go there every single weekend. Good thing I will be moving closer to them soon. 😉 Anywho, it was really nice to just be with a friend and becoming one with nature. When we got to the top, I saw the prettiest view. I decided to leave my phone in the car, so I didn’t get a picture, but we all have to step away from technology sometimes. Marvelous was.. listening to my cravings and getting In-N-Out. 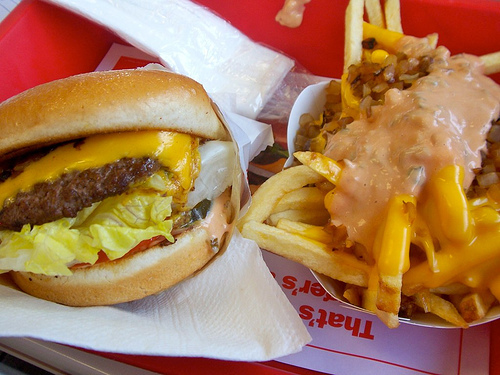 If you live on the west coast of the U.S.A., you know exactly what I mean when I say they have the best burgers. Everything is fresh. You can see them make all of the food, even the french fries. I can’t get enough of it. 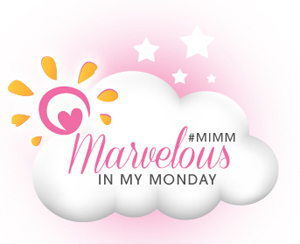 Marvelous was.. stretching and almost being able to do the splits! Stretching and yoga has really helped with my flexibility. I’m loving it! Marvelous was.. taking a nap on Saturday. Need I say more? -How was your Easter? What did you do? -What’s your favorite form of exercise? -What are you excited for this week?